As I've said before on this blog, good news is rare these days - and it's even rarer after the violent, hate-filled weekend that we're all struggling to recover from - so I'm quick to jump on a good story when I see it. Today's good news: The federal National Institutes of Health (NIH) approved a five-year, $3.8 million study at the Albert Einstein College of Medicine to see whether marijuana can reduce opioid use for adults dealing with chronic pain. 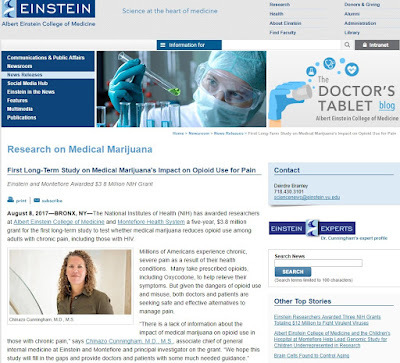 The Einstein College's MMJ study - will its results be taken seriously? This is surprising on a couple different levels. First, marijuana is still classified as a Schedule I Controlled Substance, meaning that the feds consider it to have "no currently accepted medical use." That categorization alone has made it difficult for medical researchers to conduct trials on the efficacy of cannabis as a medicine. The DEA, which enforces the Controlled Substances Act and maintains a hardline stance against medical marijuana, has a huge impact on the kinds of drug studies the NIH can approve. So it is kind of amazing to see historically and rigidly anti-pot federal agencies serve up a ton of money to a study that may end up contradicting their own assertions. Second, Jeff Sessions, a decidedly anti-pot figure, is head of the Justice Department, which oversees the DEA, so on many levels you'd think that there would be no chance in hell for research like this to receive federal support. Perhaps the Sessions team was too distracted with other things (the AG's mini-feud with our egomaniac-in-chief?) to notice this funding and put a stop to it; or perhaps he has taken the amazingly pragmatic view that any kind of research that may help solve the nation's awful opioid addiction problem is worth funding. Also - and I know this is going to sound crazy - Sessions may not be as anti-pot as his past words and actions have indicated. After all, he is AG in 2017, not 1977, and with all these states setting up legal markets in defiance of federal law, he kind of has to play nice. Sessions's recent correspondence with the governors of Colorado, Washington, and other weed-friendly states suggests he's more into monitoring what's going on there instead of marching in the Drug War shock troops. But there could be yet another angle to the approval of this MMJ research funding. The federal government has approved large-scale studies on marijuana before - for the sole purpose of concocting data to back up its assertion that marijuana is a terrible, horrible, no-good very bad substance. These included the La Guardia Report (1945), the Shafer Commission (1972), and a comprehensive report by the National Academy of Sciences (1982). The problem was, all of these studies came to the conclusion that pot really wasn't all that bad, and warranted both more medical research and a softer policy approach. The results of these studies were politically inconvenient for drug warriors like Harry Anslinger, Richard Nixon, and Ronald Reagan, so they were never addressed. So is this new NIH funding an honest attempt by the federal government to understand medical marijuana's' potential to help one of the worst medical crises our nation has faced in years? Or is it another attempt to use slanted "scientific research" to confirm what the DEA keeps saying about medical marijuana? The study's abstract suggests it will be legit, but who knows what caveats the Einstein College had to agree to in order to secure the funding. If the study shows that marijuana is indeed a helpful and less harmful alternative to opioid pain medication, there's no guarantee that the feds won't just sweep it under the rug, like they did with all their other expensive marijuana studies. The makers of Oxycodone and other opioid producers would certainly pressure them to do so, and their impact on federal drug policy and enforcement is well documented. I'm not saying this good news will eventually turn sour, but I'm highly suspicious of the federal government's sudden interest in honestly testing the validity of medical marijuana.